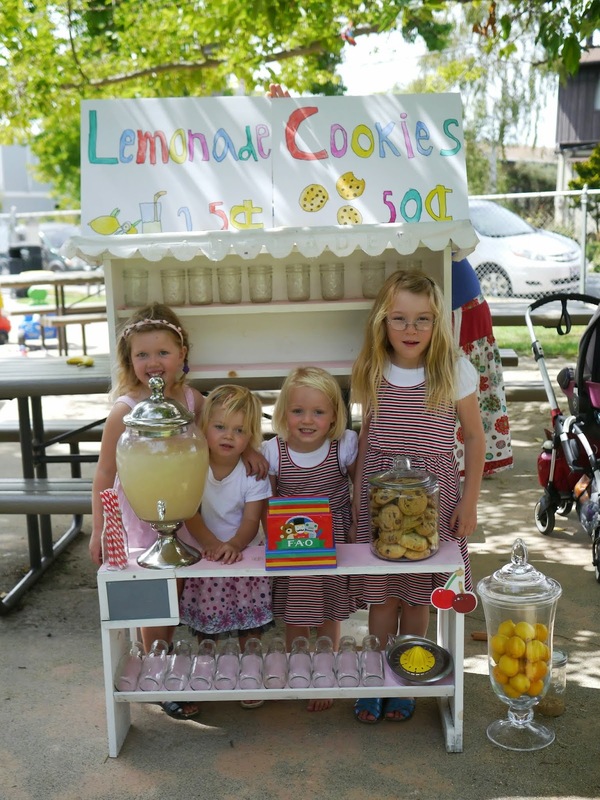 Who could resist buying lemonade and choc chip cookies from these little entrepreneurs? Ava made the cutest hand lettered water-colour signage to promote their stand. One sign for the lemonade and another for the cookies. We set the stand up in a local playground where we knew there would be lots of hungry and thirsty customers. It didn't take long before the customers started pouring in. Oh look... here they come! It was a little windy and the signs kept falling down from the stand - oops! Undeterred, the kids used this to their advantage and took it in turns walking around the park with the signs up to drum up business. The kids worked really well together and had such a great time. Ava was a good helper to the younger kids and supervised as they poured the lemonade and handed out cookies. It was a great lesson in teamwork. The lemonade stand was a great math lesson too with the kids having to work out totals and change. Three cookies and three lemonades. That'll be $2.25 please. Here's your change. After a few hours at the playground the lemonade and cookies were pretty much all gone. But the cash register was full! The kids had so much fun with their lemonade stand. And I was surprised at how much money they made! Ava and Lola can't wait to have a lemonade stand again. Next time Lola wants to sell gummy bears too. So, so cute! Looks like they made some serious money. Thanks Leslie! The kids did pretty well out of it. Here is something else fun to do with the kiddos in the bay area! Ringling Bros. and Barnum & Bailey Presents LEGENDS is coming to the Oracle Arena from August 14-18, to the SAP Center at San Jose from August 20-25, and to Cow Palace from August 28-September 1. If you click on this link to purchase tickets http://www.ticketmaster.com/promo/mbkdqz - then click the performance you would like to attend, then click on the link for “Got an Offer Code” and enter the code MOM2 in the box, click OK, and save 40% on all performances Monday through Friday, excluding Holidays, or save 20% for all shows on Saturday, Sunday, or on Labor Day. Savings not valid on Ringmaster Zone or VIP seats; no double discounts; limit 6 tickets per order. Behold the living legends! Experience unimaginable family fun, as amazing performers from around the globe perform awe-inspiring feats of daring, spectacles of strength and thrills of wonder to summon the mythical and the mysterious: a Unicorn, a Pegasus and a Woolly Mammoth! Join us for an unforgettable family night of legendary proportions! Oh my goodness! The little cash register! Who could say 'no' to those little darlings ?!? I know... how cute is that cash register?! Is that totland? That is such a great toddler park.